John G Matthews will be delighted to provide you with professional, yet friendly classic car wedding hire for your happy event throughout Kent and adjoining areas of the south east of England. We chauffeur weddings during weekdays and weekends, any time of the year. Call John Matthews today to book your chauffeured Morris Minor wedding hire. We’ll get you to the ceremony in style! We are also available for exhibition hire and film / TV work! 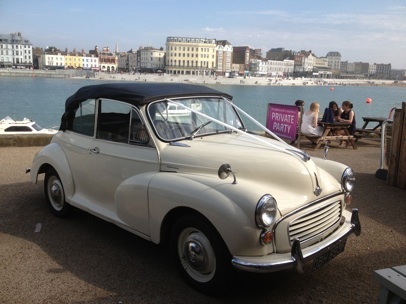 Chauffeured Morris Minor Convertible Wedding Hire Throughout Kent and surrounding areas. Starting at £200 for the day in the East Kent area. (There is an additional small milage surcharge if the wedding is outside the East Kent area, depending on distance to the wedding - contact John for more details). Morris Minor convertible chauffeured classic vintage car wedding hire throughout the south east of England and Kent based in Thanet.